Clay Martin of Colonel Crawford was all smiles after receiving his runner-up medal following the 800-meter run at the OHSAA Div. III track and field championships on Saturday at Jesse Owens Memorial Stadium in Columbus. Martin posted a time of 1:56.43 to finish second in the race. Colonel Crawford freshman Chad Johnson reached the podium in his first OHSAA Div. III track and field championships appearance on Saturday at Jesse Owens Memorial Stadium in Columbus. Johnson placed seventh in the 3,200-meter run with a personal record time of 9:32.6. COLUMBUS — Clay Martin’s third trip to the OHSAA Div. III track and field championships produced a second consecutive appearance on the podium, but this time around the medal hanging from his neck was state runner-up silver. The Colonel Crawford senior distance specialist claimed second place in a highly competitive 800-meter run on Saturday at Jesse Owens Memorial Stadium in Columbus. A strong kick down the final stretch ensured that Martin would end his stellar career with hardware in hand. He finished the race with a time of 1:56.43. About an hour before the race, Eagles coach Preston Foy said if Martin could run the event in 1 minute and 55 seconds, he would give himself a chance to win the race. Talk about prophetic words. Martin won both the 800-meter and 1,600-meter championships at the Div. III regional in Tiffin the previous weekend. He said the decision to compete in just one event at the state meet was made after he and his coaches had the chance to look at the times of other athletes entered in both events. Columbus Academy’s Logan Baker won the 800, posting a time of 1:54.02. The junior exploded from the middle of the pack to take the lead midway through the first lap of the race and held on to win. Martin said despite Baker’s big move, he stayed true to his gameplan, which proved to be the correct decision. “My plan was to stick with the leaders as close as I can and then on the last lap try to do some damage,” Martin said. Martin and Adam Price from Tuscarawas Central Catholic ran nearly shoulder-to-shoulder for much of the race, but Martin’s superior kick allowed him to pull away from Price on the final straightaway. 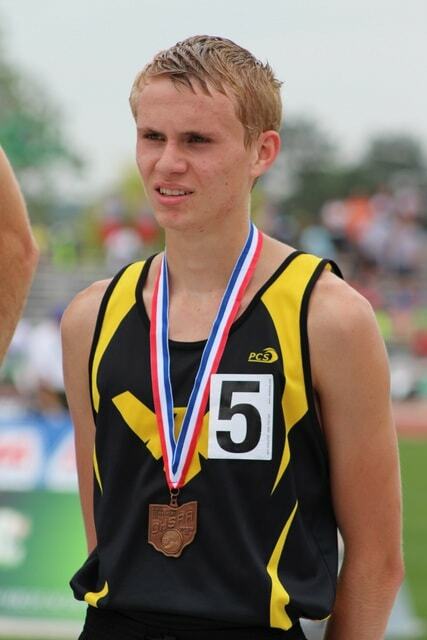 Martin placed eighth in the 1,600 meters at the 2014 OHSAA meet and was part of the Eagles 4×800 relay squad that came in 10th place in 2013. He was also a key fixture on the Colonel Crawford cross country squad that finished eighth at the 2014 OHSAA meet. Martin was the Eagles top placer at the cross country championships, finishing 27th. Colonel Crawford freshman Chad Johnson was also a member of the cross country squad and he placed 33rd at the state meet last fall. Johnson’s magnificent rookie campaign at the varsity level ended Saturday with him standing on the podium at Jesse Owens Memorial Stadium. A strong performance in the second mile of the 3,200-meter run saw Johnson push past more than half of the field to claim seventh place in his first OHSAA track and field state meet. He finished with a time of 9:32.6, smashing his previous personal record by 11 seconds. Johnson hung around at the back of the field for the first mile of the race, then slowly reeled in runner after runner in the third half-mile segment. With one lap to go, he was in 10th place and then ran the final 400 meters in an incredible 1:04.09 to outpace three other runners and earn his place on the podium. Tristan Dahmen of Maplewood won the 3,200 state title, finishing in 9:16.99. He outkicked Logan Smith from Mineral Ridge, who posted a time of 9:18.16 to earn the runner-up medal. Johnson reflected on the success of his freshman season, expressing a measure of disbelief at how well he has performed.